For the past few weeks I’ve been laid up with two different, but related back muscle injuries. Constantly pushing myself, I had a minor strain during a long run. Instead of resting then, I spent the remainder of the weekend moving furniture and continuing to train. So now, I’ll be skipping the Marine Corps race (10k, not the marathon) this weekend and letting the wife run it alone. Things have gotten a lot better though, and we went indoor rock climbing last night, but I just don’t think I can manage the race *and can’t allow a so-so time :). During this time, I’ve been using a fair amount of heat pads. In need some of more, I recently stocked up on them along with lots of cold medicine. The best part of all – everything I got was… FOR FREE! These aren’t trial sizes either; we’re talking regularly sold products. 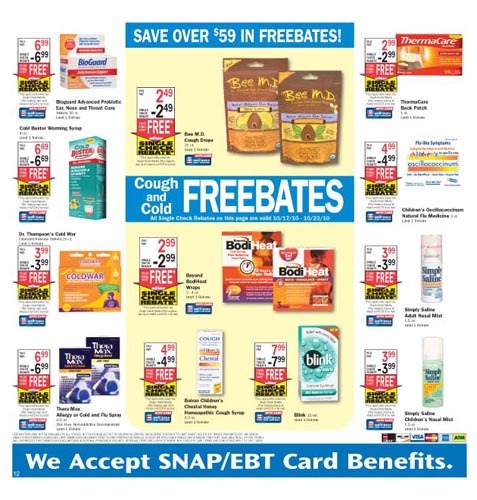 Really have to give them credit – RiteAid offers are pretty incredible. Check out the photo from the ad, they were offering almost $60 in goods completely free. The process for rebates can be a pain (remnants of last Black Friday – cutting off UPCs, mailing in forms, and photocopying receipts), but their process couldn’t be any easier. Once you’ve signed up through their site, simply enter the receipt ID information (store #, register #, transaction #) and that’s it! You submit it, wait for approval, then request payment and viola – a check is in mail within 2 weeks. A big advocate on cutting your expenses down whenever you can, there’s a hierarchy of discounts. As many other bloggers have noted, sometimes the savings isn’t worth the time or hassle. Coupons are at the bottom primarily because you don’t get much return considering the time spent (the percentage off the regular price is generally under 25%), online discount codes are good since their quick to find and easy to apply, buy 1 get 1 offers are great since it’s an immediate 50% discount, but RiteAid Freebates, as they call it, are really the icing on the cake. When you look at how much time you spend, how much you can shave off the original price, and how useful the products are its hard to dispute. Scanning the print/online ad beforehand (5 min). Locating the easily identifiable, yellow “FREE” tags inside the store (10-20 min). Submitting the receipts (5 min). Household goods are always in demand. You never stop using shampoo or brushing your teeth. And all of these items have a long shelf life. If you buy them now, they should last anywhere from 3-5 years. And when you combine those two factors – high demand & long shelf life – then there’s no reason to stock up when they’re “giving away the store” so to speak. Wow! Thanks for sharing this information.